Be aware that the tour pricing does NOT include park entrance fee of 15 per person. I thought it must be some sort of national park to charge a fee, but actually think park as in theme park--privately owned business. The ATV excursion and other excursions are available for purchase once you enter the park. Also, the tour fee does NOT include mandatory 25 fee for insurance on the ATV. As for the actual ride, it was hard and fast on sandy desert soil. It does take a lot of arm and hand strength to manage the ATV and keep up with all of the other vehicles. Having taken other ATV/4-wheeler adventures in other locations, I booked this tour for my boys 19 and 16 and their friends 19 and 15 thinking it would be a fun afternoon adventure for them all. Instead all I heard was complaints. Instead of more than 2 hours of riding time they had less than an hour and a half and it was all done with everyone in a line at such a slow pace that the boys were all bored. In addition, the tandom ride that the 15 and 16 year old had to do because they were too young to have their own vehicle in spite of the fact that one had a drivers license and the other was close to it turned out to be a ride behind the other driver rather than next to the driver, so they had to hold on and couldn't see. It sounds like a lot of time was spent at the wildlife portion of the tour and that the animals on hand were more of a gimmick than an attraction. 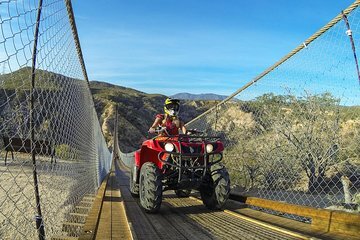 Pick a different tour if you want to have a fun ATV adventure in Los Cabos. This was a very good tour. The machines are nice. The guide took us fast enough to be pretty exciting, and the terrain is beautiful. My only knocks are 1 it takes about 5 hours total to ride for about 90 minutes. Just getting there, getting outfitted, and getting back are all slow. And, it is more expensive than advertised, because you have to purchase insurance once you get there. That said, it was a good experience, and worth the money. Well done tour. Beautiful area. Dont miss the nachos at the bar afterwards either.